When someone puts on earbuds, they're pretty much telling the rest of the world to not bother them. It's the universal symbol for shut the hell up. 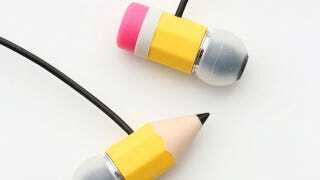 But if someone put on this Magic Pencil earbuds? That's a conversation starter. I mean, these earbuds make it look like a pencil has been stabbed in one ear and out the other. They're hilarious!